Home Collector Car Life	1976 Porsche 911 Barn Find Find New Home in Sweden! 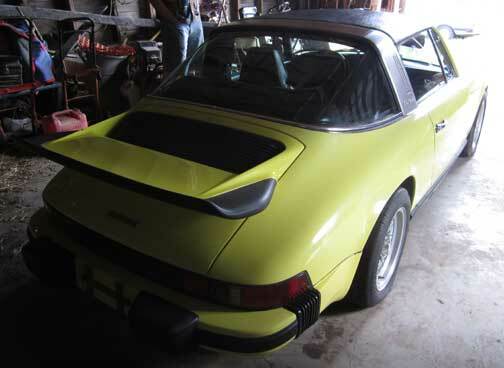 I’m always on the look out for vintage cars with potential, so I was surprised to get an email from my brother last week about this 1976 Porsche 911S model that he found on Craigslist about an hour Southwest of the Twin Cities. Remember now, my brother, Sean, lives in Sweden. He’s planning a trip to come over to Minneapolis with his family to visit, so, like any good car guy, he’s combing the classifieds here to see what he might find that’s worth taking home to Sweden. 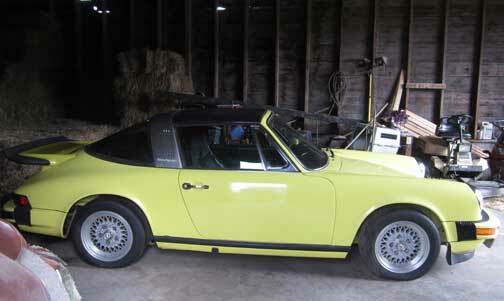 Sean emailed me with a link to a Craigslist ad for this 1976 Porsche 911. It was in rural Minnesota, parked in a barn (with a concrete floor) for the past 5 years. According to the Craigslist ad the car “ran when parked, 5 years ago”. Sean talked to the owner, long distance from Sweden and scheduled a time for me to go out and inspect the car for him. The general thinking was, that if the car is in good cosmetic condition, most importantly, if it’s a dry, rust free, original car, it would be well worth the asking price. Sean has some experience working on 911s of this vintage. He has a 1978 911 SC model and a good friend of his has a 1976 S model, like this one,t hat they are just putting back together after a fairly serious mechanical freshening. If we could strike a deal with the owner, I could haul it out of his barn and put it in a friends warehouse for a while until Sean comes over to visit with his family. 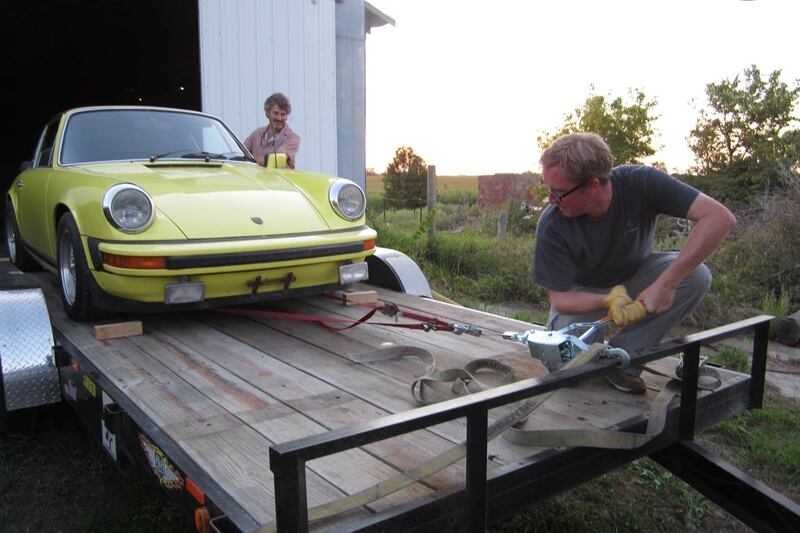 Then we could arrange shipping in an ocean freight container back to Sweden where Sean could work on the car, get it back in running order and have a great looking vintage 911. So last Wednesday morning I drove out to the owner’s farm near Arlington, MN, not knowing exactly what I’d find. As I pulled into the gravel driveway I saw an early 1970s Mercedes-Benz 450SL sitting outside with grass growing up around it… It was clear, even from a distance, that it was rusted out in all the usual places, not much more than a parts car today. 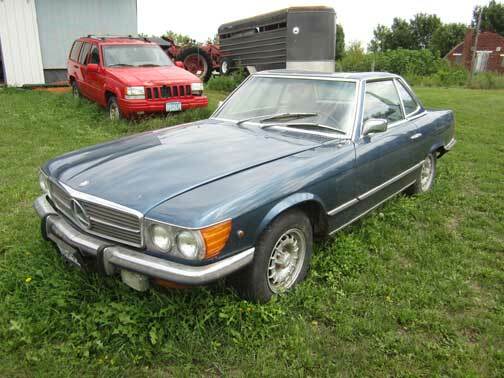 The 1972 Mercedes-Benz 450SL, I hoped the 911 was better taken care of, after all, it was stored inside. When I got of my car the owner greeted me, like every Craigslist transaction, you’re never quite sure what to expect. Was I lured to the next Ed Gein compound where I would end up in the freezer only to be found years later once the police caught on? Thankfully, the guy who met me was perfectly normal… as perfectly normal as an old Porsche aficionado could be anyway. He mentioned that he had just sold his vintage Porsche 912 to his mailman and he recently purchased the BMW Z4 that was sitting next to the house. It was time to clear out some of his old cars. I walked into the concrete floored steel building, the whole rear corner was stacked to the ceiling with bales of hay, for their horses. 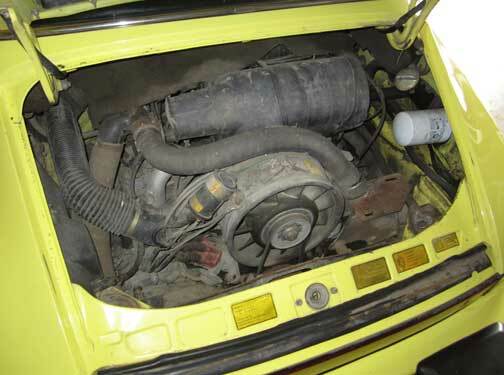 There, in the middle of the room was the lemon yellow Porsche 911 Targa. As soon as I saw it I decided it looked better than I expected. It is a completely stock vehicle, except for the period BBS wheels, which I rather like, and the added fiberglass whale tail. The paint is of exceptional quality and looks to be original, all the way around, I opened the doors and hood, engine compartment, I looked everywhere and I couldn’t find any tape marks, over spray or any evident of body or paintwork. Solid and great looking, all the way around. No evidence of paintwork… fun, funky 1970s Porsche color. I took out my flashlight, the most important tool you could have for a job like this. It’s important to look in all the hard to reach places to look for rust or evidence of accident damage or poor repairs performed many years ago. The engine compartment was dirty and full of cobwebs, but everything looked to be there. There was some oil under the engine, but that is to be expected, as seals dry up and crack allowing the fluids inside to leak out over time. There were enough very old cobwebs going from the bottom of the car to the floor to convince me that this car probably had been sitting in this same spot for 5 years as the seller claimed. 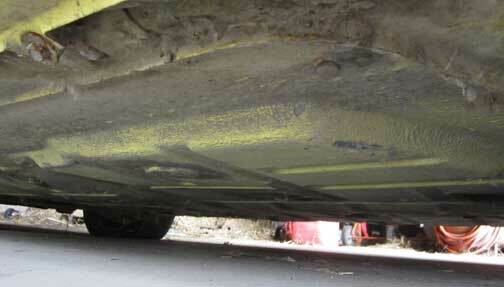 Underside of the car shows original paint… NO rust, but lots of cobwebs and dust. Engine compartment… dirty and dusty, but all the original stickers and equipment is in place. One of my big concerns was pest damage… it’s not uncommon for a car like this to house multiple generations of mice, especially when stored in a barn like this for so long. While inspecting the interior I noticed some very old evidence of mice… just some droppings and seed shells under the carpet on the passenger’s side. I would have been surprised not to have found something like that, but that seemed to be the extent of the infestation. 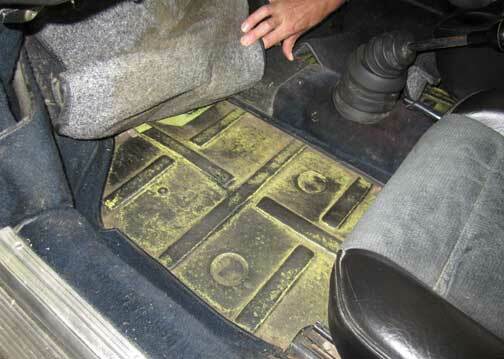 I looked long and hard in the front trunk compartment and in the vent tubes for mouse nests, but found nothing. I was very pleased to see completely original, solid floors on both sides of the car when I lifted up the interior carpets… rusty floors on vintage 911s are very typical and would have been a deal breaker. You can fix mechanical things.. engine, transmission, etc. easily, but body work is just so expensive and time consuming, and never as good as the original, you have to just walk away from rusty cars. Great looking original floors underneath the carpets. After my long inspection I texted my brother and asked him to give me a call… I had seen the car. He called me right back and we chatted… no rust, floors look good, the paint, amazingly, looks original, no serious rodent infestation, largely original, etc. etc. I handed the phone to the owner so Sean could talk to him and let him know how we’d be putting the deal together. I would leave a deposit on the spot until Sean could send me a wire transfer with the balance of the purchase price, once I had the money I would return in a few days with a trailer and tow vehicle to haul the Porsche away and take it to a storage facility until we can ship the car to Sean in Sweden. So, that was that… As I was leaving the farm I wondered how many other cars like this are hidden away… it’s not like this is a rare car, it’s not… but how many other interesting cars are sitting in barns and sheds in these rural areas that won’t see the light of day for many years? When there is no lack of space somewhere, when people can just park another car outside next to the barn (like the Mercedes) they often stack up, the sad part is, that unless the cars are inside, like this Porsche was, they will quickly deteriorate to something only fit for the scrap heap. I imagine this will be a great car for my brother, I hope it is… and I wish I could be there when his daughter, my niece, sees it for the first time. 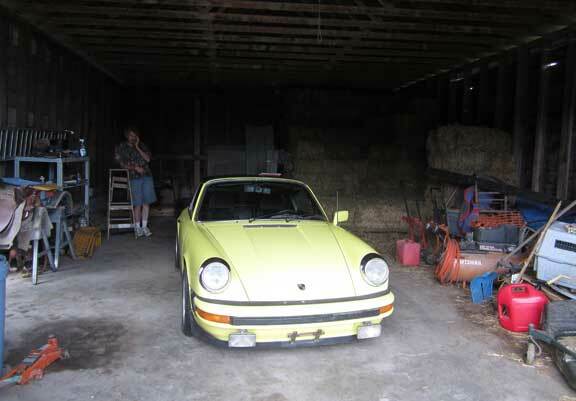 She absolutely loves his red 1978 911… what will she think when a bright yellow one shows up?